December | 2010 | KITCHENOLOGY: The Study of All Things Kitchen! KITCHENOLOGY: The Study of All Things Kitchen! So, last night I just googled a few things and winged it! I’m finally comfortable enough to do that… about time! This is exactly how I made it, but you can do your own variation! I’ve posted the two recipes that I read before tackling. Happy cooking! Thaw out broccoli in the large soup pot with a small amount of water over med heat (just until thawed). Prepare celery and potato. Using the same pot you thawed out the broccoli in (with all water dumped out), heat EVOO over medium and saute celery with salt, pepper, nutmeg and onion powder for 3-4 minutes. Coarsely chop thawed broccoli while celery is sauteing. Add broccoli, potato, chicken stock and milk to soup pot. Bring to a boil and then turn down to low to simmer for 15-20 minutes. Keep covered. Remove from heat and use immersion blender to puree soup – be sure to keep the neck below the surface to prevent splattering! There are lots of variations that you can take from here. Sub all low fat milk…. use vegetable broth instead of chicken stock…. add carrot or more celery…. change up the spices… add bacon (Kirk did this the next day and said it was awesome)!!! 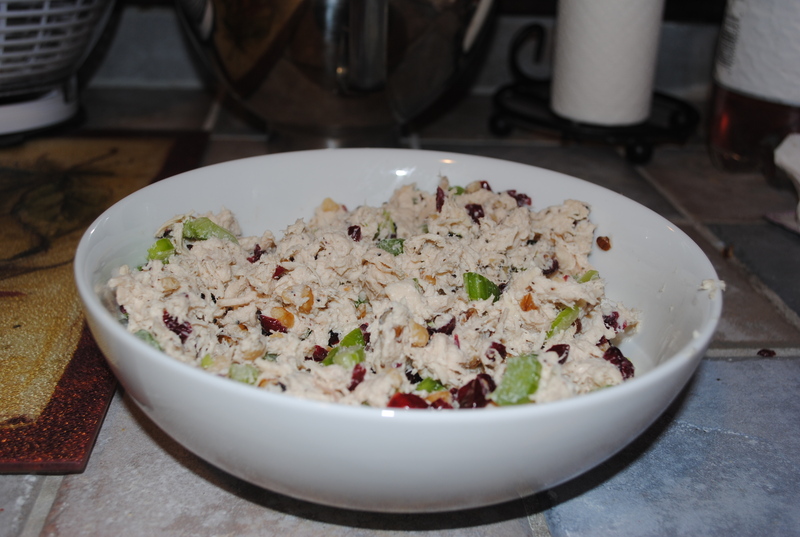 I love chicken salad, it is one of my favorite things to eat any time of the year. Most of the time I buy it pre-made at Costco, which is really good because they use their roasted chicken breast, but I can’t always go through all of it. So tonight I made my own version. Place the chicken breast in a saucepan and cover with cold water. Heat just until simmering and then turn down to low-med for about 15 minutes. 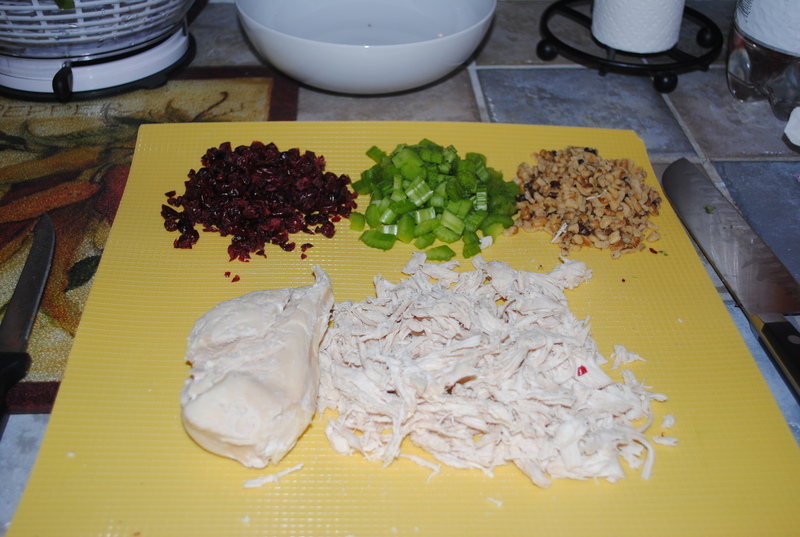 Remove and let cool, then shred chicken with a fork. Make sure it is cooked completely through first by cutting into the middle and confirming there is no pink left. While the chicken is cooking, prepare the rest of the ingredients. Mix all ingredients together either by hand or in a kitchen aid mixer…. voila! I am going to make wraps out of it this week for lunch. I think my combo with the chicken salad is going to be: whole grain 8″ tortilla by Harris Teeter, thinly sliced vine ripened tomatoes, Haas Avocado and Organic Spring Mix (bought 1/4 lb loose in the produce section for $1.07!). 1. Don’t boil frozen chicken, it must be thawed out first. 2. Don’t store your un-cut tomatoes in the refrigerator – it can change the flavor. 3. After washing your lettuce of choice, try to get as much water off by using your salad spinner and then air drying for a bit. Store in a ziplock bag with a paper towel at the bottom, it will help continue to absorb any moisture which can make the lettuce go back more quickly.